FILE - In this July 20, 2015 photo, fishing boat captain Hoai Dang poses for a photo in Honolulu Harbor. Hawaii fishermen are once again being allowed to catch a prized tuna species in the fleet's most productive fishing grounds west of the islands, sparking criticism that they are adding to overfishing. 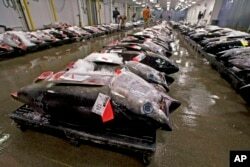 The National Marine Fisheries Service closed the fishery in early August because Hawaii-based longline fishermen hit an annual bigeye tuna catch limit of about 3,500 metric tons set by international regulators. But the agency on Friday created a rule allowing the fishermen to report up to 1,000 metric tons of bigeye as being caught by the Northern Mariana Islands, which is a U.S. territory. The change allows Hawaii fisherman to catch more bigeye tuna than the maximum set by the Western and Central Pacific Fisheries Commission. The commission, which is an international body that regulates fishing by the U.S., Japan, China and other nations fishing the area, doesn't set limits on the catch of territories. The two-month closure of fishing grounds affected 145 active vessels in the Hawaii longline fleet, said the Western Pacific Regional Fishery Management Council, which develops management plans for U.S. fisheries in Hawaii and other Pacific islands. Environmentalists have sued the fisheries service to stop the attribution of bigeye catch to U.S. territories, arguing it undermines international agreements aimed at eliminating the overfishing of bigeye. The case is pending in federal court in Honolulu. David Henkin, an attorney for Earthjustice which is representing the plaintiffs in the lawsuit, called the agency's latest decision "shortsighted.'' He said all developed fisheries — like Hawaii's longline fishery — need to reduce their catch to make sure bigeye is available for future generations. FILE - In this May 12, 2009 photo, bigeye tuna line the floor of the United Fishing Agency's auction house in Honolulu. Federal regulators are allowing Hawaii fishermen to resume catching the species in their most productive fishing grounds. Mike Tosatto, Pacific Islands regional administrator for the fisheries service, said the reopening will have a negligible impact on the status of bigeye stock. He said the fisheries service reassesses the catch attribution plan each year to make sure it addresses overfishing. "The fisheries service obviously takes addressing overfishing seriously,'' Tosatto said. Bigeye stocks in the area are down to about 20 percent of their unfished levels, according to data from the Western and Central Pacific Fisheries Commission. Scientists advising the commission have warned about bigeye overfishing every year since the international body was established in 2005. Bigeye is one of two types of tuna known as ahi. The other is yellowfin. The longline fleet supplies a large portion of the ahi consumed in Hawaii, where bigeye is often eaten raw as sashimi and as poke, which is a dish featuring cubed tuna seasoned with soy sauce and other condiments. Bigeye is also frequently cut into steaks and grilled. Fish landed by the Hawaii fleet is worth about $100 million a year, ranking Honolulu among the nation's top 10 ports in landed value, according to the Western Pacific Regional Fishery Management Council.